Power, versatility and strength are kept in your pocket with the Smith & Wesson M&P MAGIC Assisted Tanto Folding Knife. The engineers at Smith & Wesson have come together to produce a hard-hitting tactical knife in a compact, rugged package. An aircraft-grade aluminum handle feels sturdy in the palm while rubber outlays provide a supreme grip even with gloved hands. A finger activated auto-open button instantly deploys a 2.8 inch Tanto blade that slices through hard surfaces with ease. Partial serration offers increased cutting power for the ultimate all-purpose blade. Designed for tactical professionals, an integrated glass breaker is built in the handle for seamless use. 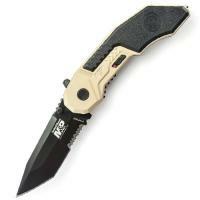 Side safety button and liner lock mechanisms ensure this knife only opens and closes when intended. To top it off, a desert camo finish gives the M&P MAGIC a sleek and rugged look.